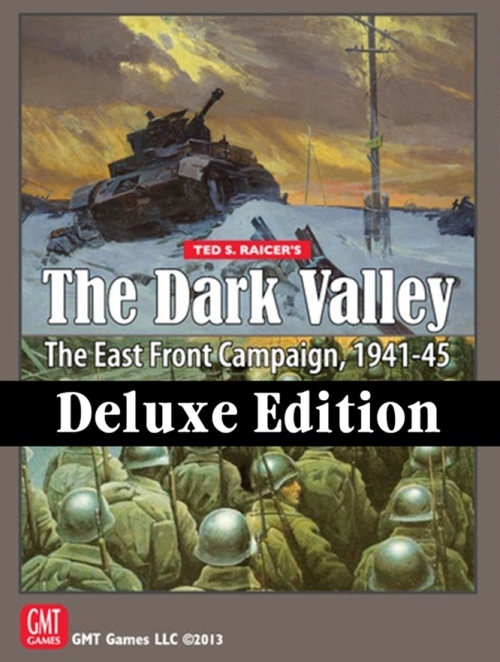 The Dark Valley covers the entire East Front campaign in World War II, on a 34� by 44� standard hex map stretching from Leningrad in the north to the Caucasus Mountains in the south,. Three and a half 1/2� counter-sheets represent every major unit that appeared during the course of the conflict. Initially most Soviet infantry are divisions, but as the game progresses these are replaced by armies and corps, so that players are not overwhelmed by the increasing Soviet Order of Battle. German mechanized units are divisions, while their infantry is a mix of division and corps. The core of the game system is a �chit-pull� activation system. Each turn a variety of action chits are drawn, in a random order, from the Action Chit Pool, and it is this that determines the exact flow of operations on that turn. This chit-pull system imposes constant uncertainty upon the player and introduces considerable tension into the game. It also allows the game to model the evolution of the Soviets and the devolution of the Germans over the course of the campaign. "TDV is my favorite design, but as the saying goes, "no design is ever finished, just published." Although the Germans intentionally have a tough row to hoe in TDV, it turned out to be a little tougher than I intended. Without changing any basic systems, but only altering a few special rules, such as the initial availability of the Soviet City Defense counters, I've made the German learning curve less steep, without changing their need to take real risks. And not all the new rules are one-sided: a simple change in the victory conditions will punish an Axis Player who attempts to hunker down in defense in summer 42 instead of mounting a serious Case Blue offensive." If you already own TDV, all the rules changes will be made available through the Living Rules, and if you are satisfied with the first edition, that's fine. But if you haven't experienced TDV, which has been sold out now for a couple of years, or if you own TDV but the idea of a Deluxe version appeals to you, here is your chance.